Finally one-stop shopping for everything you need for your introductory majors course! 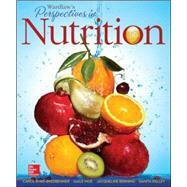 Building upon the long-standing strengths of Wardlaw's Perspectives in Nutrition, the tenth edition author team has taken a garden-fresh approach to revising this highly regarded text. Every paragraph has been scrutinized to ensure that students are exposed to scientific content and concepts that are explained accurately and precisely, and in high-interest fashion that will draw students into their first study of nutrition science. Students will benefit from a carefully crafted text that brings them up-to-date scientific thinking and research blended with dynamic activities that will allow them to apply their knowledge to their own lives and future careers. Instructors will have the ability to assign auto-graded coursework and tutorials that are assessed against Learning Outcomes. The textbook content also serves as the basis for an adaptive, diagnostic self-learning tool for students that will help them acquire mastery and improved grades.